In 2014, Zuma Office Supply was recognized by Austin Gives, the Mayor of Austin, and John Paul DeJoria with the Charitable Champions Award as one of the most philanthropic businesses in Austin. Also recognized that year were eBay, and The Coffee Bean & Tea Company, both great companies who do good work for others as part of their business model. This year’s awards were held in downtown Austin and emceed by CBS KEYE News anchors Walt Maciborski and Hema Mullur. 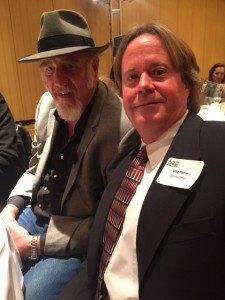 The featured speaker and award presenter was Ray Benson, the nine time Grammy Award winner, and leader of Asleep at the Wheel, the beloved Texas Swing band with over 25 albums and fans worldwide. Ray won over the audience with some impromptu music and compelling stories about what giving back means to him, and how he’s worked to help others throughout his life. Zuma President Greg Pierce with nine time Grammy Award winner Ray Benson at the Austin Gives Awards. “We all know how important business philanthropy is to the well-being and social sustainability of our community. Austin-based businesses have a long standing history of giving back, often with little or no public recognition. Austin Gives: Recognizing Businesses Giving Back is committed to changing this lack of attention and to increasing the level of charitable contributions made to the community by local businesses. Austin Gives viewed Zuma’s model of donating over 50% of profits to charity, plus our corporate volunteerism with multiple charities as truly above and beyond. This included our annual Capital Area Food Bank food drive, in partnership with Vandegrift High School, which has raised thousands of pounds of food and healthy meals for families all across Central Texas. Zuma recognizes the winners of this years Austin Gives GeneroCity Awards! Zuma sends out special congratulations to this year’s winners, recognizing them as revolutionaries in how business is done the right way — through giving back to the community and helping others. The winners are: Silicon Labs, Yellow Cab and South Texas Money Management. Congratulations to all! This entry was posted in Office Supplies and Charities and tagged Austin Gives, Giving Back, office supplies, Ray Benson, Zuma Charity Support, Zuma Office. Bookmark the permalink.